Certain dog breeds love to chew and dig and getting them out of this habit is pretty much impossible – it’s part of their instinct. However, you can stop them from destroying the wrong things (i.e. furniture, TV remotes, mail, your lawn, the kids’ xmas presents). Here are just a few ways to tame your hound’s destructive behaviour. Dogs like to destroy things for various reasons. You should first consider whether your dog is destroying things whilst you’re in the home or when you’re not in the home. If they’re doing it whilst you’re present, it could be attention-seeking behaviour – your dog knows that you react once they start destroying the things you love. If they’re doing it when you’re not in the home, it could be the result of separation anxiety of simply boredom. Understanding their motive for massacring your mink rug could help you to remove the trigger preventing them from then savaging your sofa cushions in the future. 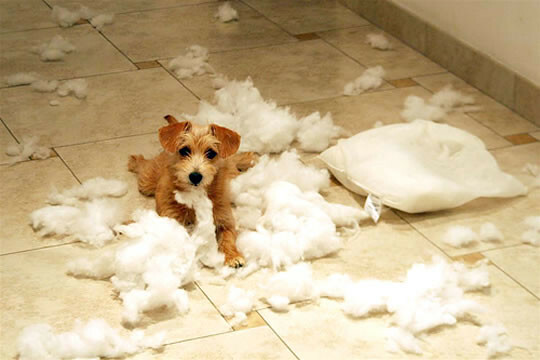 The simplest way to limit your dog’s destructive behaviour is to protect items in your home. This is particularly worthwhile with puppies that don’t yet know right and wrong (older dogs should no better and you shouldn’t have to dog-proof your home for them). You can hide items out of reach and create no-go areas (these could even be separated by a gate). You can also use scented sprays to deter your dog from wanting to chew certain items such as certain plants and items that could be potentially toxic. Protecting items won’t remove the urge to chew, so you’ll need to add some items to your home that are free to play with in order to give them the outlet they need. 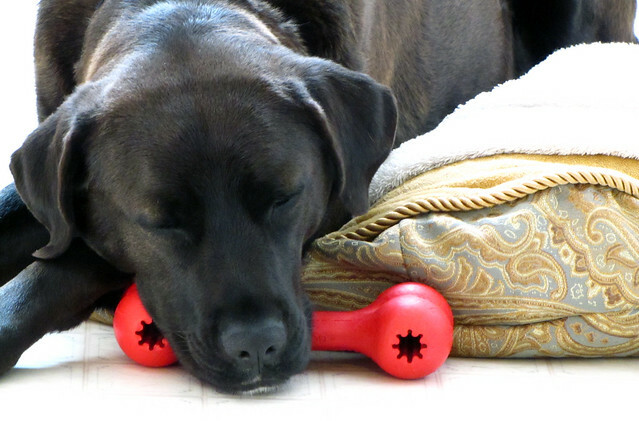 One dog toy isn’t enough – many dogs, particularly puppies, will grow bored of one toy much like children and will then move onto items that they’re not allowed to chew. Buy a range of toys but don’t let your dog have them all at the same time – by rotating them your dog will be more interested in each individual one as they’ll know that they only have a limited time to play with each toy. You don’t always have to buy new toys and there are plenty of DIY dog toys that you can try such as tug-ropes made of old t-shirt and empty plastic bottles with treats in. As for dogs that love to dig, consider designating a tiny area of your garden for digging. If your dog isn’t getting enough playtime, they may be using destructive behaviour to get your attention and entice you to play with them. Think about whether your dog is getting enough interaction with you and consider increasing it if possible. Long walks and games of fetch with your dog could help to not just give your dog the stimulation it’s after, but also knacker it out, all in all leading to less destructive behaviour. You could even consider hiring a dog-sitter if you’re not around enough to give your dog the interaction it needs – puppies and energetic breeds often need a lot of playtime to keep them stimulated, which is something you may not be able to fit around a busy working schedule. You could also consider seeking out professional training for you and your dog. Training isn’t just for extremely unruly dogs and can benefit most owners and their canine companions, particularly puppy training which helps to stamp out bad habits early. A trainer may be able to determine the cause behind your dog’s destructive tendencies and work out if it’s something more than simply boredom or attention seeking. If the destructive behaviour has recently developed and seems out of character, it’s possible that there could be a medical problem spurring on the behaviour. One of the reasons that puppies love chewing so much is because they’re teething and their gums hurt – similarly adult dogs with dental pain could start chewing again as a way of relieving the discomfort. Get your dog’s mouth checked by a vet to see if there are any problems that need addressing. Is Your Home Kitty Ready?